I really should be thankful for my wonderful, food loving husband for helping me find these delicious and different breads for my blog. When looking to bake for the alphabet L, I wanted something savory. We have had enough of the sweet breads and pastries and we no longer had any appetite for it this week. 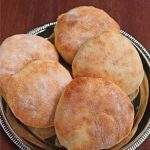 That is when my husband found this vegan and very simple bread called Lagana, which is baked for the Clean Monday, the first day of Lent before Easter. This traditional Greek bread is made dairy free as it is used for fasting and hence it is a great vegan flatbread. If you are new to baking, I would absolutely recommend trying this recipe out. 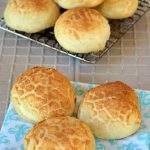 It is one of the easiest bread recipe and a great way to make friends with yeast. The procedure is very straight forward with very basic ingredients. There is no specific shaping technique involved in the recipe. Make the dough, let it rise, dump it on a pan and stretch. Then the bread is baked and served. 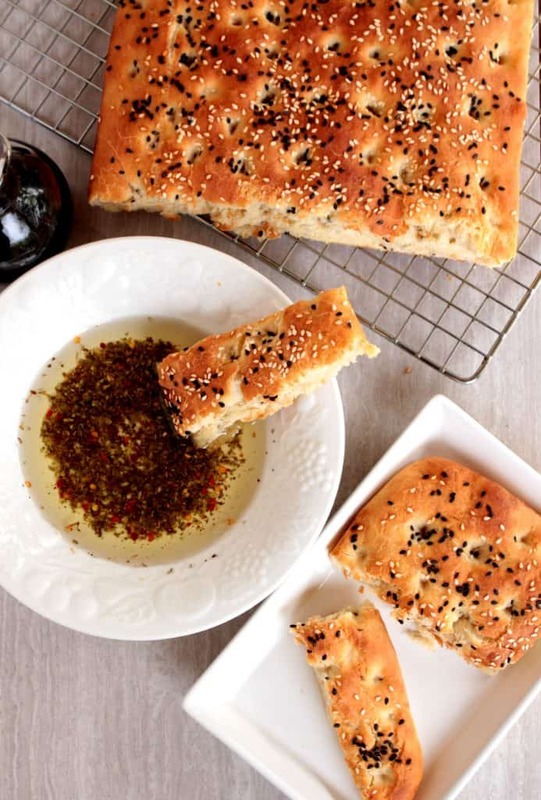 The bread tastes great by itself, and if served with the herbed Olive oil (shown in the pictures), it just tastes out of the world. I will be sharing the recipe for the herbed olive oil soon. 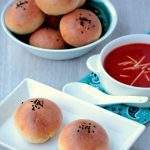 I have used both black and white sesame seeds on top of the bread. 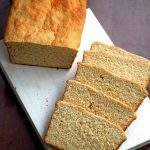 We love sesame seeds and I have used quite a bit in the bread. If you are not a fan of sesame, you could skip it or use any other herb of your choice to top the bread. 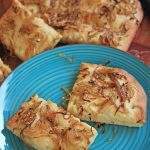 This bread is very similar to the Italian Focaccia, which happens to be one of my other favorite bread. 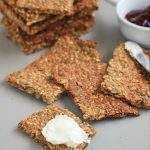 I have used strong bread flour to make the recipe, but I will be trying it soon with half whole wheat and half bread flour. For this A-Z baking around the world, I have had all the posts scheduled for 6 AM in the morning. I had the bread baked, clicked and all ready to go couple of days ago. Little did I know that I would not have time to write the post and my day will turn out as crazy as today. My oldest was scheduled to have a oral surgery this morning at about 9.30 AM. He has an extra tooth growing inside his gums, horizontally disrupting his other normal teeth. It is a simple procedure, but he would be going under complete anesthesia and that scared me a bit. We were delayed quite a bit in the doctor’s office as his earlier procedure took longer than expected and my poor boy was waiting almost 2 hours until about 11.30 until they took him in. He was already tired, starving and stressed, but luckily the team put him at ease right away and got done with the procedure very quickly. I was hoping to come back by 11 AM and get done with the post, but we didn’t come back until 1 PM. I got him a milkshake on our way home and then got him comfortable. He slept for couple of hours and then woke up feeling hungry and sore. Finally after I was able to get him something to eat, he settled down a bit and I got around typing the post. What a day it was and I am hoping that the poor guy gets some sleep at night and not have too much pain. Well, he is not going to be eating bread anytime soon and I have to figure out different soft foods to feed him for the next few days. Thankfully, he thoroughly enjoyed eating this bread before the surgery. In a bowl, combine the yeast, sugar and lukewarm water. Mix it well and let the yeast proof for about 5 to 10 minutes. The yeast mixture would be very bubbly at the end of the 10 minutes. If not, the yeast might have become inactive. Discard this mixture and start with a fresh batch of yeast. I made the dough in my stand mixer. Add the flour, salt and olive oil to the bowl. Mix it a bit and then add the yeast mixture to the bowl. Knead the dough until it is very soft and not sticky. The dough will be on the softer side, but should not be sticky. Add more liquid or flour to get to the right consistency. 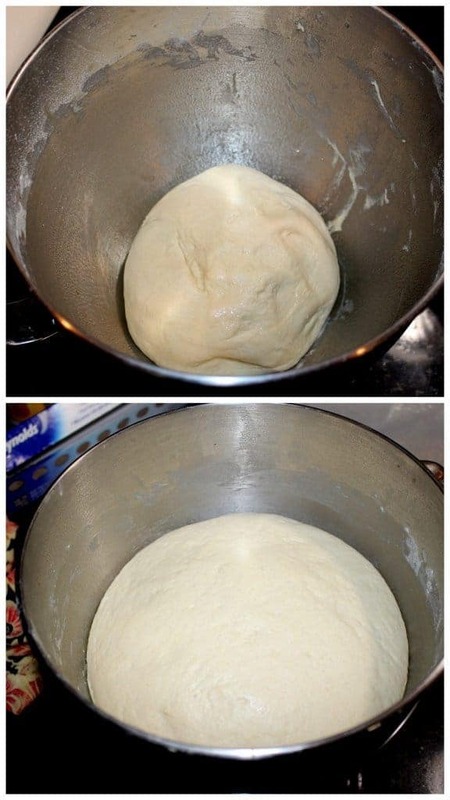 Grease a bowl and place the dough in the bowl to proof. I usually grease the mixer bowl and place the dough in it. Cover it with plastic wrap and then with a kitchen towel and place it in a warm, draft-free place. Mine took about an hour and a half to double in volume. 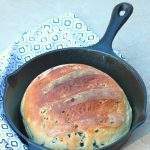 Grease a 8 x 12 rimmed baking pan with olive oil. Punch the proofed dough gently and place it on the pan. Using your hand, stretch the dough and spread it all across the pan. If you find it hard, you could gently roll the dough and then spread the rest in the pan. Traditionally, the dough is spread using the hands. Try to keep it even thickness all around. Mix the sugar and water for the sugar wash and using a pastry brush, brush this over the surface of the bread. 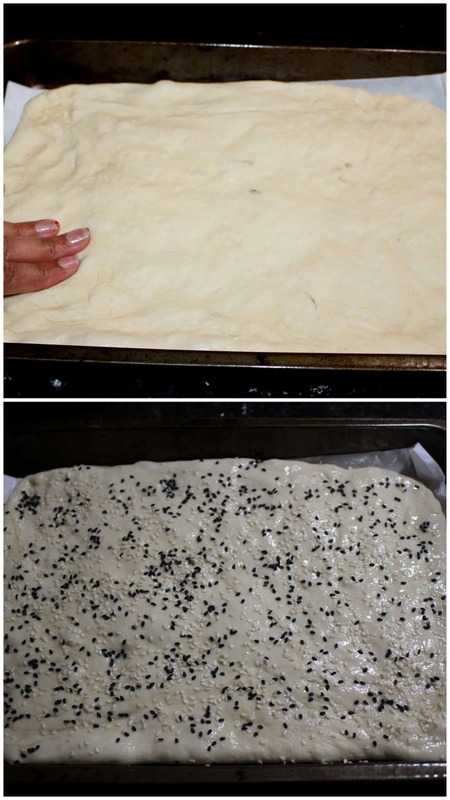 Sprinkle the sesame seeds over the bread and then cover it with plastic wrap and a kitchen towel. Let the dough rest for about 30 to 40 minutes or until it is puffy. At the end of the resting time, preheat the oven to 400 F.
Once the dough is ready, using your fingers, makes deep grooves onto the surface of the dough. Take care not to pierce the dough. Just make deep, gentle marks. Bake for about 25 to 30 minutes or until the bread is deep golden brown and sounds hollow when tapped. Let it rest in the pan for about 5 minutes and then remove it on a rack to cool. You could slice the bread in about 10 minutes. 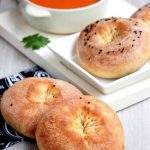 The bread looks simple but fantastic..I am sure it must have tasted heavenly with that herbed oil.If not using bread flour , we can use regular apf ?.. 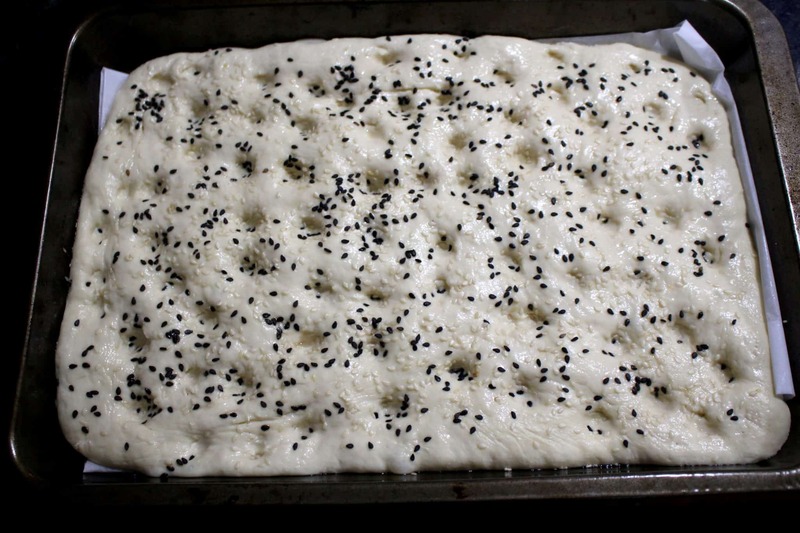 The bread looks awesome with all the sesame seeds…can imagine what an amazing flavour it would have been. Awaiting your recipe on the herbed oil. 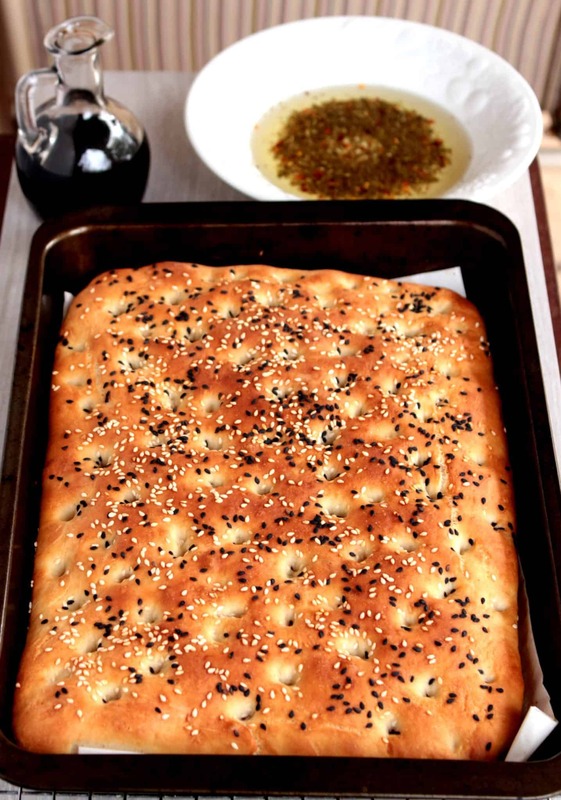 I baked this Lagana bread few days back and love it. This vegan bread rock. Oh how sad, how your lil one is doing better now. Take care. 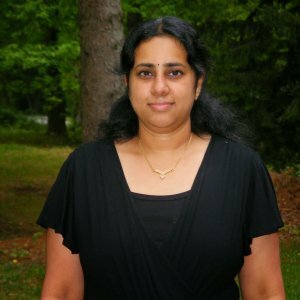 Sandhya I am really enjoying the whole baking marathon, you all have come up so many different kinds of cookies, breads, cakes etc. 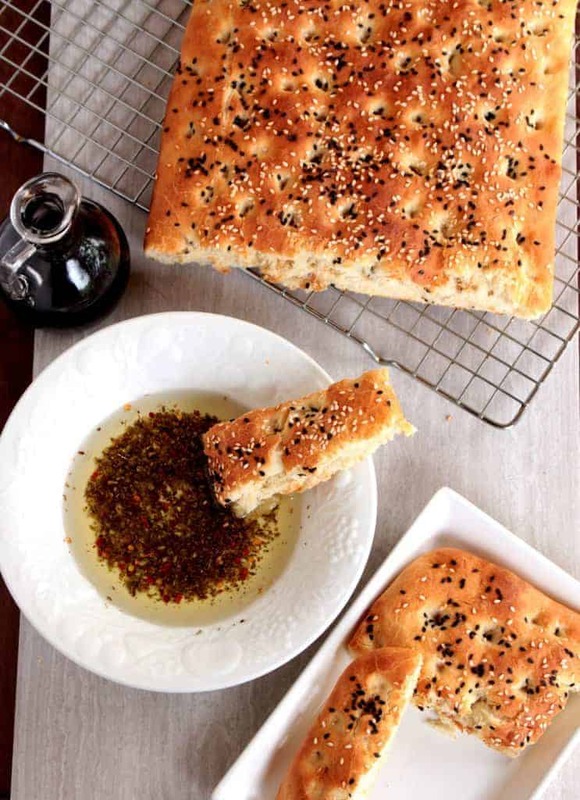 Love your simple Greek Bread, looks so similar to the Italian focaccia. Wishing your son a speedy recovery. They usually are quite strong. Hope your son is much better now Sandhya..I am drooling over your bread. it sure looks fantastic! Tell me about dental procedure. Vaandu also had a similar problem and sabbbaaa I don’t want to think about it even. Hope he is feeling better now. Between this is a fabulous bake. Dental stuff is no fun, sorry your son is having to deal with that. This bread looks tasty and simple. The bread looks amazing! I think I would eat half of it on my own if nobody stopped me. I hope your son is feeling better! Love a good flat bread and this looks so delicious..! Such a pretty color and those black sesame seeds make it even prettier. You son is lucky to have you for a mom – a great caretaker and a wonderful cook. This lasagna bread looks absolutely amazing and it’s full of yummy herbs!! You gotta love a food lovin husband! This looks great. I can’t wait to try it. I thought at first glance it said lasagna bread, and thought that sounded delicious, but then I saw the delicious bread being dunked in olive oil, and that was even better! Yum! Love flat bread, and love the vegan option! Can’t wait to try out this delicious looking recipe! I can’t possibly survive without bread, and I refuse to listen to people who say you shouldn’t eat bread if you want to keep a nice wasteline. A lovely flatbread, I like the sesame seeds and they must give a nice flavour to it. It almost reminds me of foccacia in terms of shape. I could eat the bread on its own and need nothing else for the day. This bread looks so good! I love making breads! This is one gorgeous bread sandhya. Love how simple it is to make. 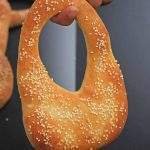 i m doing the greek theme this week, and i m in a dilemma between this bread and a dessert! That looks so good. It reminds me of focaccia. Dunking it in seasoned olive oil is certainly the way to go. My heavens you’ve been baking up a storm. Nice hubby to help you find recipes to finish your bread alphabet. 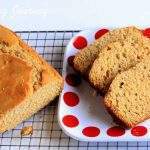 You make the best bread this is another lovely recipe. I wish I could have a taste and then the dipping sauce wow! I’m loving you and this series. This bread looks lovely. I feel like I wouldn’t need anything else to go with it. This pagans bread looks so delicious feel like taking a bite off the screen loved the white and black sesame seeds on it.. simply awesome!! That was quite a day for both you and your son. Glad to hear that he’s on the mend. 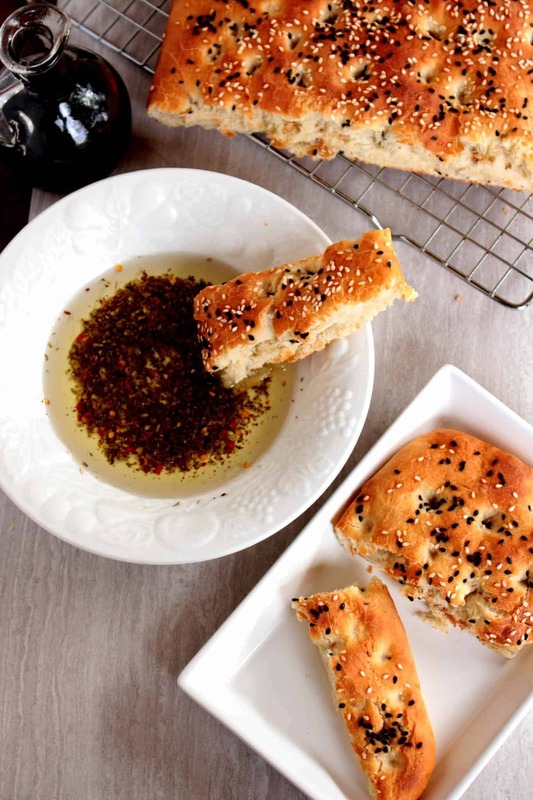 This Greek flatbread looks similar to focaccia — love that sesame seed topping. lovely bread.. Perfect with any soup.. This bread looks scrumptious. 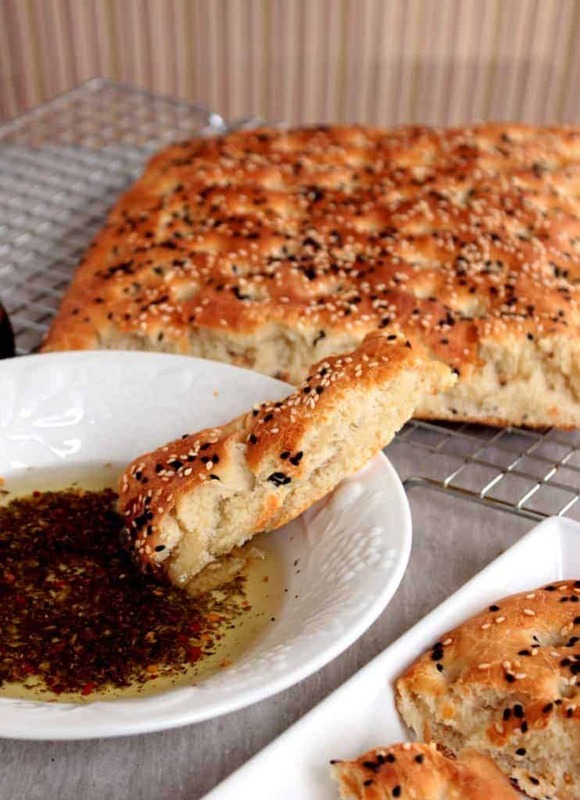 It reminds me quite a bit of focaccia, but I love the addition of the sesame seeds. Thanks Jenni! 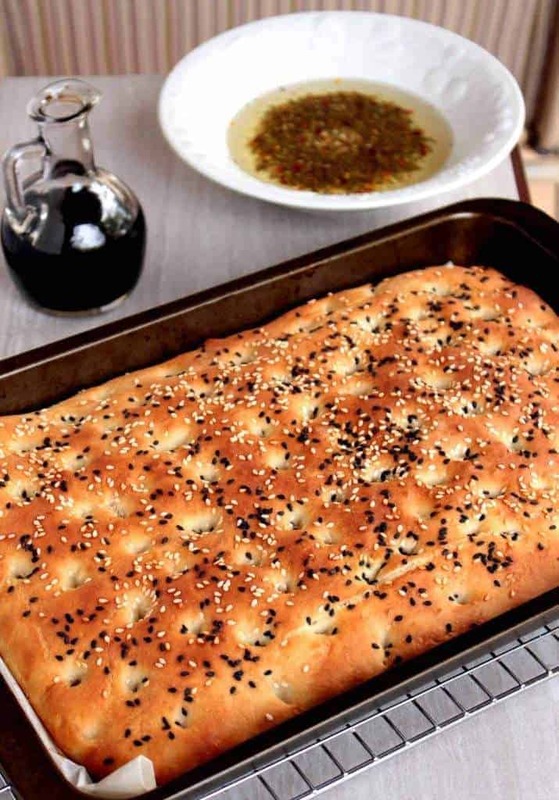 Yes it is quite similar to focaccia.